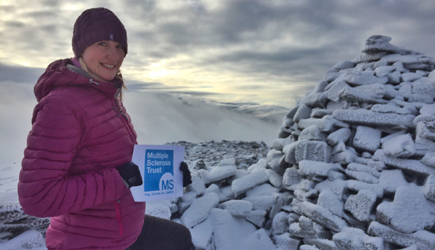 Ginty Telfer-Wilkes has always loved hiking and climbing in the Highlands of Scotland and she's determined not to stop now that she has MS.
She also has an offer for anyone with MS or any MS fundraisers that wish to trek in the Scottish Highlands. Hiking and climbing in the mountains of Scotland is where I belong, so you can imagine how I felt when I got diagnosed with relapsing remitting MS (RRMS) in August last year. In early January I started getting numb skin from the bottom of my left foot, right up to my middle. I had severe nerve pain under my right arm, along with more numb skin on the right side of my torso. Much to my surprise, the GP suspected MS from the very first appointment. After all the usual tests it was confirmed on August the 4th that I did indeed have RRMS. It’s possible I’d had the disease for 6 years as I’d had a bout of optic neuritis in 2009 and if I had had any symptoms, they obviously didn’t last or I didn’t think anything of them until this year. After I’d got over the fear and upset of what may happen to my body in the future, I started looking at the present. I made a conscious decision not to let the MS stop me from doing the things I love. I’ve had two relapses this year but thankfully all my ongoing symptoms are mostly sensory ones: numb fingers and skin, fatigue, anxiety attacks and Lhermitte's sign (electric shockwaves going down my back when I bend my head forwards). I get my words muddled up and I’m quite forgetful but I think that’s fairly normal for me anyway. After some time out following the initial diagnosis, my husband and I headed down to Perthshire to attempt an easy mountain walk to see how I got on. My husband, Rob, is a qualified Mountain Leader, so I knew I was in safe hands. It was late September and unbelievably we were actually getting that Indian summer that is always promised by the newspapers. Schiehallion is one of the famous Munros (mountains in Scotland over 3000ft) as it was used to create the first Ordinance Survey Maps. With a walking pole in each hand we started up the long path towards the summit. I would say this is one of the easier Munros I have attempted; the paths are well maintained, fairly straight forward and not too steep. If I made it to the summit it would be my 61st out of the 282 Scottish Munros. As we got higher, the views surrounding us were just stunning. Loch Tummel and Loch Rannoch stretched out, sparkling in sunshine far below us to the right and the green hills of Perthshire to the left. The path disappeared a few hundred meters from the summit and the terrain got pretty rocky underfoot. I pushed on to reach the summit at 1083m (3553ft) above sea level, I was delighted to have made it and on such a beautiful day too. On returning home after the hike I decided to post a photo of myself at the summit of Schiehallion on Twitter and the Facebook MS support groups. The response I got was overwhelming, people wishing me well and saying I was an inspiration. It was bizarre as I didn’t see myself as an inspiration, as climbing mountains is something I’ve always done. It was then I thought that maybe I could do something good with my diagnosis and encourage other MSers to get out and do something, and I don’t mean attempt to climb a mountain as many people with MS feel like they’re doing that on a daily basis anyway. I just want to encourage those who are feeling trapped by the disease to be positive, even if it just means being able to get out of bed in the morning and face the day with a smile. I am obviously in the early stages of my MS and under no illusion of what the MS may do to me in the future. My aunt had progressive MS for many years and recently passed away from pneumonia, so all the more reason to live my life now, in case I can’t in the future. Since my diagnosis, my outlook on life has completely changed. My positivity and the amazing support of my husband, family, friends and work colleagues, helps me a great deal. I swim, rock climb, canoe and hike my way around the highlands of Scotland and refuse to let MS stop me from doing so. Yes there may be times when my body doesn’t work properly but there are all terrain wheelchairs and various aids to help with mobility. When fatigue or pain strike then I’ll take the time I need to recover and then get straight back out there again. There are plenty of days that I don’t feel like doing anything, but I force myself to get up, get dressed and go to work, go swimming or climbing and to be honest, it makes me feel so much better. Would you like to trek in the Scottish Highlands? My husband has offered to guide, free of charge, anyone who has MS and also anyone doing a charity walk in aid of MS. So go on, give yourself a challenge. You might even surprise yourself. If you or anyone you know are interested in guided walks in Scotland please go to to the Highland Trekker website, call Rob on 07860 302755 or find him @Highlandtrekker on Twitter or on the Highland Trekker Facebook page.